If you’re a regular shopper at JCPenney, you’ve probably seen the JCPenney credit card being offered at the checkout line. But how do you know if it’s a good fit for you? Here are just a few pros and cons to consider. With the JCPenney Card, you’ll earn one point for every $1 spent in both JCPenney stores and affiliate brands like Sephora. You’ll also enjoy a bonus $10 rewards certificate for every $100 spent in total, and there’s a sign-up bonus of 10-20 percent off depending on the merchandise type. These aren’t particularly generous terms when you compare the JCPenney card to other credit cards, but they aren’t stingy, either. Points expire at the end of each calendar month, so you’ll need to be a regular JCPenney shopper to make the card worth it. You’re also limited to 10 rewards certificates a month, so even if you’re a big spender who routinely drops more than $1,000 on shoes and handbags, you can only earn $100 in rewards in a four-week period. The JCPenney card does have an application process, but it isn’t a stringent one; many shoppers apply and are instantly approved right there in the checkout line. Low credit scores aren’t a problem, and debts to other institutions won’t stop you from qualifying. 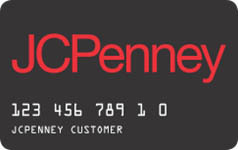 Unless you’re deep in the red with holds on your bank account, you should be able to obtain a JCPenney card with ease. The JCPenney card carries strict penalties for those who don’t pay their monthly balance in full. You’ll have to fork over 26.99 percent in interest if you haven’t paid off that washing machine, the highest APR of any department store credit card currently on the market. It doesn’t matter if you’re meeting the minimum payment amount each month; if you want to avoid paying interest, you can’t carry an outstanding balance at all. Regular users of the JCPenney card have the chance to become either “gold” or “platinum” members with bonus rewards. To become a gold member, you’ll need to spend more than $500 at least twice a year; to become a platinum member, that number doubles to $1,000. As you rack up the points and enjoy deals and discounts from your card, these numbers are easily reached, creating a cycle of purchases and rewards. There isn’t a lot of transparency when it comes to card policy. For example, JCPenney’s website offers differed interest for furniture purchases of $1,000 or more, but some users report being charged anyway because their balance wasn’t at zero at the end of the month. As for the initial sign-up offer, fashion jewelry earns 20 percent off, but fine jewelry only earns 10 percent. You’ll need to carefully read the fine print before using a JCPenney card. In addition to points and discounts earned by the card itself, you’ll also enjoy a lot of exclusive offers from JCPenney in the form of coupons, leaflets and vouchers. These will be sent directly to your mailbox or inbox. For example, gold members receive a $15 coupon each year on their birthday, and $10 coupons are sent periodically for things like holiday sales or back-to-school shopping. Platinum members are offered free shipping on JCPenney.com. User reviews indicate that JCPenney’s customer service department could use a little work. You can also check their official FAQ page and see for yourself that it hasn’t been updated in awhile; it’s still advising customers to use AOL and Netscape Navigator, two brands that have become defunct in today’s virtual world. These are just a few of the pros and cons of a JCPenney card. If you’re thinking about taking the plunge, keep these things in mind before signing on the dotted line.